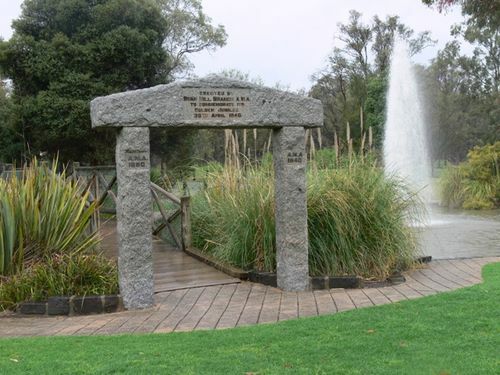 A stone arch commemorates the Golden Jubilee of the local Australian Natives Association branch 1940. The arch was in memory of the pioneers. SWAN HILL, Wednesday. The golden jubilee of the Swan Hill branch of the A.N.A., established in 1890, was celebrated today and tonight. Many visitors from various parts of Victoria were present, including the chief president of the A.N .A. (Mr. Hughes). In the afternoon a marble memorial arch to the pioneers was unveiled before a large attendance of the public and school children. The visitors were welcomed by the president of the Swan Hill branch (Cr. G. E. Kurrle), and the memorial was handed over to the borough council. Visitors attended a civic reception by the mayor and borough councillors. A Jubilee smoke social in the town hall this evening was attended by 400 branch members and visitors. Age (Melbourne), 30 May 1940.